1920s Carny burlesque at Dr Sketchy’s Melbourne this Halloween! Join us on Wednesday 29th October for Halloween Party Time as Limber L’amour twists, bends and contorts while Sir Antonio Alessandro charms us (and Limber L’amour!) with his double bass! Performers in true carny style! 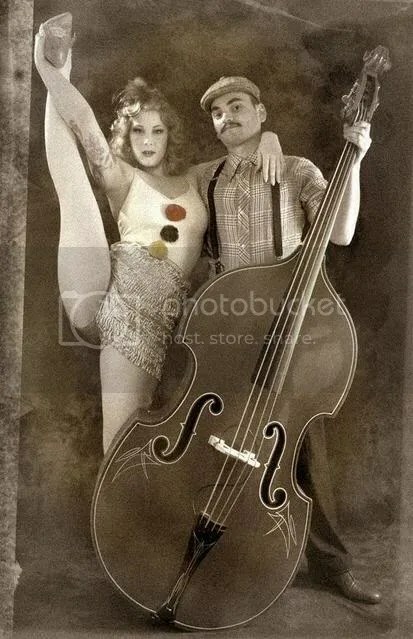 Limber L’amour is a 1920’s/30’s inspired carnival burlesque and contortion performer. Trained contortion, rythmic and ballet en pointe and an inspired by all! With recent performances at Red Door Burlesque, Cristal Burlesque and Toff in Town’s Aint No Sin! Sir Antonio Alessandro, rock-a-billy/psychobilly double bass playin sweetheart of Limber L’amour! Double Bass player with “Perfect Sin” and guest bass player with the upcoming Australian Tour of KC and the Moonshine Band!